What to Eat After Completing 7 Day GM Diet? What to Eat on 8th Day After Finishing the GM Diet? 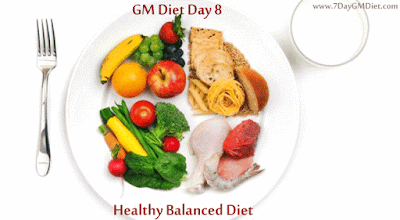 Wondering what to eat on 8th day after completion of the GM diet? Many of the readers have asked this question in the comments and a few through email. So, I thought of explaining this topic as a separate post rather than replying to them so that it can help everyone who’re in a confused state about what to eat after completing GM diet program for a week. Overweight or Obesity, is undoubtedly, one of the biggest problems faced by most of the people these days. The scientific solution to lose weight is to increase the expenditure and decrease the consumption of calories. Generally, our body burns a certain number of calories even while we’re completely at rest. That is called the Basal Metabolic Rate aka BMR. This BMR varies from one individual to another, based on several factors such as height, weight, age and lifestyle. So, if a person’s BMR is 1500 calories per day, then his body will burn those 1500 cal even if he does nothing. However, if the same person consumes around 2000 calories or more, then his/her body will store the remaining 500 calories in the form of FAT cells, resulting in weight gain. So, according to this principle, losing weight is purely calculation. Spend more than you consume and you’ll obviously shed weight. Now, let us come to our topic. Most of the people who follow the 7 day diet plan will lose around 4 to 7 kgs, depending on how they followed it. Unfortunately, there are several other factors that interfere with weight loss, due to which a few people might not get such fantastic results. Let us assume you’ve followed the diet properly and lost around 5 Kgs of weight in the span of 1 week. You’ll definitely gain weight after the 7 day diet, if you get back to your old lifestyle (eating habits). There is actually no guarantee that the weight you’ve lost is permanent. To be frank, there is no diet plan in this world that promises such guarantee. It is because, our body weight depends on how we manage it and it is a continuous process. If you wanted to stay fit and healthy, then you should always see what you’re eating. Consuming unhealthy or fast foods may lead to obesity and it is an open secret. So What Should You Eat After Completing GM Diet? If you want to avoid those lost pounds from coming back, then you should definitely change your diet routine. It is advised to consume low carb high protein diet in order to maintain your weight permanently or until your next GM diet session. Failing in doing so will obviously ruin your efforts that were put into following the General Motors diet program. 1 pound of FAT = 3500 calories; 1 KG = 2.2 Pounds; In order to lose 10 Kg of weight, you should spend/burn around 10 x 2.2 x 3500 = 77000 calories. Since, reducing such a huge number of calories won’t happen even in the dreams, it is recommended to reduce a minimum of 500 to 800 maximum per day. So, if you cut down 800 calories per day, then it would take 77000/800 = 96 days to lose 22 pounds/10 Kgs of weight naturally without following any crash diet plans. What to Eat After Finishing GM Diet? First, calculate how many calories you need per day and based on the BMR value, you should plan your meal plan accordingly. Below, you can find sample meal plans for both vegetarians and non-vegetarian eaters. If your BMR is under 2000 calories, then you can consume either the 1200 calorie meal plan or the 1500 calorie meal plan. No matter, what your BMR is, you should never go below the 1200 calorie limit as it would impact your health in a negative manner. Along with the above diet routines, below are a few tips which if followed will result in much quicker weight loss. Avoid high calorie foods like noodles, samosas, pasta and all kinds of foods that are high in carbs or starch. Replace the white foods (white rice) with brown colored foods (whole-wheat). Brown rice is always better than the White rice. Try to stop your coffee or tea drinking habit and consume Green tea for weight loss. It is both healthy and boosts your metabolism. Soups are very beneficial for losing weight as they aid in better digestion. Include this Cabbage soup or Tomato soup in your daily routine. Try to allot at least 30 minutes every day to perform exercises like cardio workouts or Yoga poses. If time is your biggest problem, then at least try to perform this 7 minute HIIT workout instead. If you follow these tips, you’ll definitely lose weight and also keep it OFF after finishing the GM diet.